When I told an old friend that you know it’s Christmas time when the tamales appear by the dozen in your refrigerator, she asked how you know when it’s Hanukkah time. “When there are eight tamales on your plate,” I said. She lives in Georgia now, but we both grew up in Phoenix, Arizona, where tamales are a holiday staple. I moved to Portland in 2000, but I still associate Christmas more closely with tamales than I do chestnuts or eggnog, and my need for the warm corn dish has only increased with time and distance. Many people in the Southwest know someone who makes Christmas tamales – a coworker’s mother-in-law, a friend’s abuela. I once met a male nurse at an orthopedist who sold homemade salsa and tamales to both staff and patients. I’d broken my elbow skateboarding that winter, and while he checked my damaged bones, I asked how business was. “Business is always good,” he said. “But Christmas is booming.” Those unfortunate souls who don’t have a personal tamale connection usually find a good restaurant that sells them in bulk. Even though he knows people who make homemade tamales, my dad has taken to getting his at a fifty year old family restaurant in downtown Phoenix. He buys five dozen red, one dozen green, freezes half of his haul to ration during the winter, and when I still lived nearby, he and my mom and I would eat the others daily from the fridge while they were fresh. Red contains beef or pork stewed in red chile; green contains a meatless mixture of gooey cheese, diced green chile and corn kernels. Neither he nor I eat the green. Mom eats those. To me, green corn tamales’ masa tastes too sweet, as if spiked with cheap white sugar, and the filling feels like a greased slug in my mouth. Because she’s my mom, I can forgive her culinary inadequacies. When I was a vegetarian, I had to refrain from eating the red tamales that I craved. During what I now think of as The Drought Years, I’d order tamales at a restaurant, and the waitress would ask, “Green or red?” Suppressing a sigh I’d answer, “Green, please.” Chewing that rubbery yellow cheese, its lumpy hulk nearly resistant to mastication, I always wished I could conjure the red chile flavor through force of will, just imagine it into being and onto my food by some sort of alimentary projection. The tongue has a memory. It does not have Jedi powers. I should have invented a tamale-flavored gum by now. They have strawberry, mint-melon, mango sorbet, every imaginable flavor. I mean, companies produce squid chips. Red tamale flavored gum would be good for vegetarians who are trying to stave off their inner carnivore. For years I’ve been joking about making an enchilada-scented air freshener designed to sooth homesick Southwesterners. The problem with so many vegetarian tamales is that they involve fillings that fail to capture the simple yet essential tamale flavor. I’m all for experimentation. Combine the unexpected, expand our palate, reinvent the wheel, go wild. But in my experience, New Agey flavor combinations involving stewed banana flower and parsnip, or thyme and spiced pumpkin, are not only hard to take seriously, they often taste like nothing more than a bowl of soup shoved into a corn wrapper. One veggie-friendly joint I went to in Northern California spiked theirs with sunflower seeds. Even by the most liberal standards, these were tamales in shape only. That and I’m a picky jerk. 14th century to 1521: Aztec culture dominates Meso-America. 1st millennium AD: Corn spreads from what would later become Mexico into the Southwest. 1848: the United States forces Mexico to sell what would later become Arizona, New Mexico, etcetera for $15 million dollars. 1889: The once svelte Germanic god Odin debuts as the remodeled “Santa,” a fat, elf-employing, North Pole resident, and after taking a bite of each of the two tamale varieties his elves brought back from Santa Fe, he bans the color green from his workshop and declares red his holiday’s official color. A few Christmases ago, I spent the holiday with my folks in Arizona. Mom called Dad that afternoon and asked, “What’d you do for lunch?” I was standing beside him at the kitchen counter. 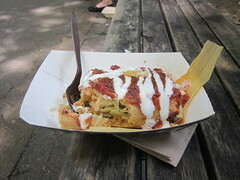 Here’s my second post from the Portland Farmers Market blog, from October 17, 2011. While picking Italian plums in a friend’s North Portland backyard recently, I angered some yellow jackets, climbed up a light pole, and ingested part of what might have been insect larvae. Besides the rain and increasing cloud cover, the last urban plums provided one more sign that summer was over. I don’t have a problem with change. Although the end of things can make me sentimental sometimes – the end of romance, the end of a vacation – I don’t wallow in it. But for some reason, this year the end of summer really hit me hard. Why can’t we Portlanders live the golden dream referenced in that surf movie Endless Summer? I like pants as much as shorts, but do I really have to fish out my beanie already? As many wise people have said in numerous ways over the millennia, the end of one thing is the start of another thing, or something – close a door, open a window, etcetera – so I’m trying to remember that. Example A: the dwindling of peaches means the arrival of pears. The markets have tons of pears right now. There are the bright, flavorful Starkrimson, and the tiny, super sweet Seckel. There’s the bodacious, curvy Comice, the variety which pairs so well with soft cheeses and that I always imagined would wear booty short were it bipedal (you’ve heard the term “apple bottom?”). There’s the aromatic red Anjou, so juicy and crisp and nice on a salad that I’ve actually woken up some mornings thinking of their taste. And there’s the boring old Bosc which I think of as a tree potato. Despite my disdain for Boscs, I will eat any pear, but my love is not equal. (Will that make me a bad parent?) Starkrimson is one of my favorites. They have a floral aroma, and their smooth flesh contrasts nicely with their firm skin. They also just look gorgeous. That luscious red exterior is beautiful. Another favorite is the Forelle. Not to try to be eccentric or feel superior to the uninitiated (my teenage self: “What? You haven’t heard this obscure 7-inch from this obscure band?”), but a few of the varieties that I think have the best flavors also aren’t the most widely available. Forelles are sort of the Northwest’s “secret” pear, which is unfortunate because they’re so good they should be dangling off trees in the middle of every American city. (Seriously, why is the Bosc the ubiquitous pear? Then again, why is white bread so popular?) For whatever reason – probably narrow growing requirements, poor insect or frost resistance, tendency to bruise in transport, and so on – their production is one of the most limited in the Northwest. Thankfully, you can find them around town between October and March. After an hour of picking in my friend’s backyard, I filled two plastic grocery bags with Italian plums. I considered turning them into jam, but I’m currently dedicated to marionberry jam, so I just ate them fresh. Also, it was obvious what I really wanted: to preserve the fruit in jars in order to prolong the season that produced them, the season I always tell myself that I love best. Then fall arrives and I remember, oh yeah, around here, every season’s good. Sunlight’s overrated.